Wondertime, September 2008, page 66. Break out the mustard — it’s time to celebrate! The September 2008 issue of Wondertime is out and marks the first time my photography is prominently featured in a full-page ad placed in a national magazine. And I couldn’t be prouder that the ad is for widely-adored and locally-owned Oliebollen. And that it was designed by Deb Pilutti, my first Ann Arbor design hero, whose work I’ve long admired for its colorful, whimsical style. I’m also learning that Wondertime is quite a sharp parenting magazine. A four-bagger indeed! 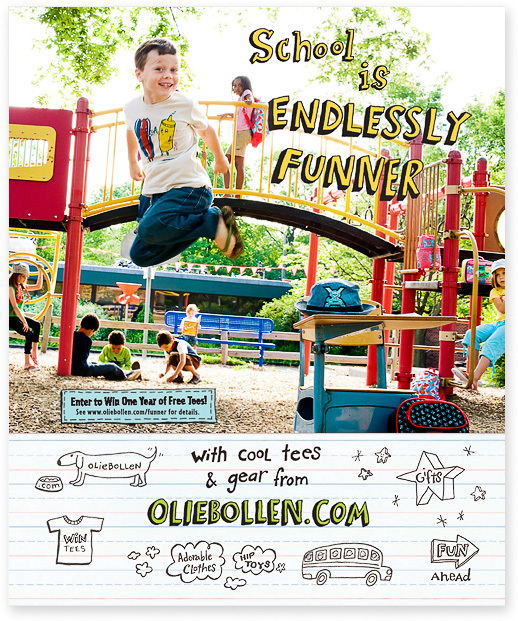 In case you didn’t already know, Oliebollen is the online resource for beautifully designed and totally cool clothes, toys, and accessories for kids. (By the way, the name “Oliebollen” is inspired by Dutch ball-shaped pastries fried in oil, eaten during holidays and happy events.) 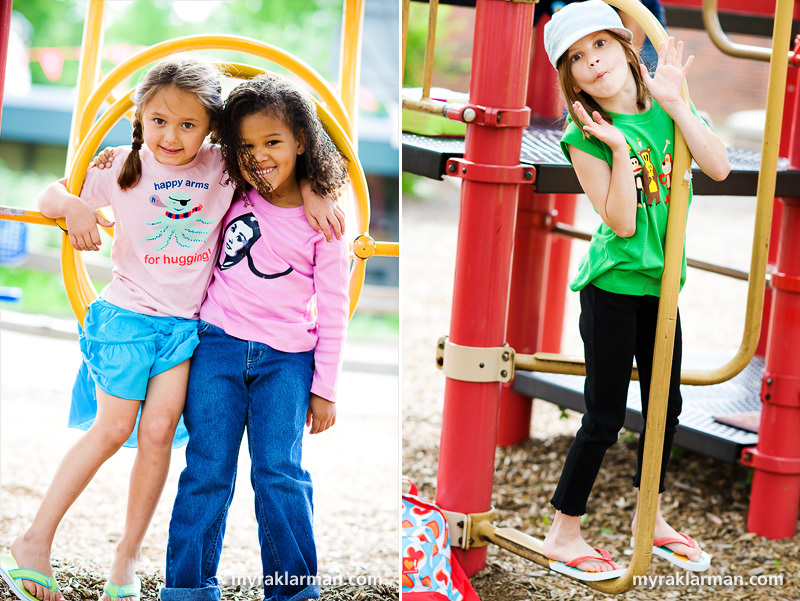 Even before I opened my photography studio, I had fantasies of shooting kids’ high fashion for this trendsetting online store. A mother and lover of European design, Margaret Schankler founded Oliebollen 10 years ago — when her daughter was in grade school and e-commerce was still just a wee baby. Soon thereafter, Deb Pilutti, also a mom and a children’s book author, became a partner. Because these things need to be done ahead of time, we scheduled the photography for this back-to-school ad just as school was letting out for the summer. Many townies will recognize the location: Bach Elementary School’s playground. 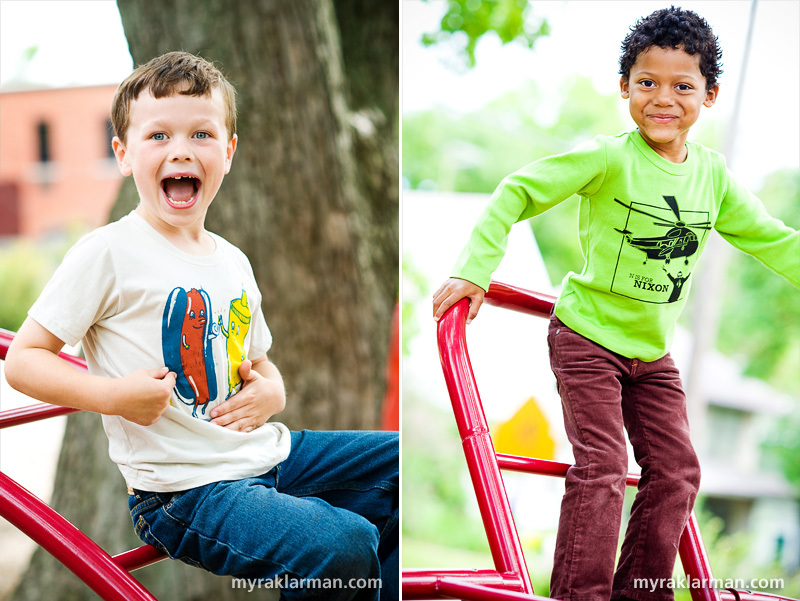 Young friends of Oliebollen and of Myra Klarman Photography were cast for the part of Kids Playing in a Schoolyard Playground, which required them to draw from their own deep reservoirs of personal experience. Ultimately, I found the performances exceedingly convincing — such pathos, such monkey business. “Bravo!” to you all. Love the vintage hotdog tee from Mini Rotation. The N is for Nixon shirt is edgy to say the least. H is for hugging (also from Mini Rotation). A is for Audrey! Can I get that one in my size? Of course we can’t forget Paul Frank’s much-loved, monkey-face designs. Cute kids! Especially those two adorable girls in the bottom left (tee hee!). Congratulations to you on the Wondertime full-pager, Myra. Congrats Myra!! Those are so awesome!!! It turned out great Myra! This is fantastic! Congrats Myra! just fantastic. your work deserves to be full page spreads in magazines. may this just be the beginning!